As bloggers, we’ve all received these. Sometimes 5 a day, sometimes none. You know what I’m talking about… the infamous, ambiguous brand email inquiry. I remember the first email from a brand I got. I was so excited until I got to the bottom of the email, and there was still no mention of compensation. Not a free product sample, no gift card, and definitely no cash. You mean they want me to go out and buy, write about, photograph, and sell my readers their product for free? Of course I said no. You know I post about brands all the time. I share what’s in my beauty bag, what my skincare routine is, and my outfits contain clothing from many different brands. Most of the time, these brands have no idea who I am. Sure, I get free products once in awhile, but the majority of the content here is sourced by my own research and shopping prowess. Now, over a year after receiving that very first brand inquiry, I think I’ve finally gathered a few tips that might help you navigate how to respond to those brand emails instead of just hitting the archive button. *Please note, the following are all real emails that I have received, but personal details have been modified to protect the offending (or awesome!) parties. How are you? My name is Jane Doe and I’m the co-founder of XYZ Company. We’re just about to launch a new product, and I was wondering if I could send you one? Let me know if you’re interested and I can have it shipped this week. They have no requirements, they just want you to try their product, love it, and share it in an organic way. I responded with my thanks (trying to hide my surprise for the simple request, I mean really!) and accepted the offer. When I posted about it, I sent her the post link. Now I recommend her company all the time and feel good about doing so. Anyways I came across your blog and love it! I see that you offer advertising and would love to find out more. Could you please send me your advertising package? I’d love to work with you. I don’t love these types of emails because there’s not much information to go off of. What type of advertising does she mean? Does she want me to try her product and post about it, or is this inquiry just trying to get me to post a link or banner type of ad? With these, they are so ambiguous and awkward to respond to. Thanks so much for reaching out and your interest in my blog! I’d definitely be interested in speaking further about a collaboration. Some of the past collaborations I have done have been in exchange for product or store credit, here is an example. I also offer sponsored posts, starting at (current rate) which means the entire post is dedicated to your products and services, 3-5 unique photographs, and social media promotion across all of my channels (Pinterest, Twitter, Facebook, and Instagram) the day of the post. Rates go up from there depending on further requests such as additional social promotion, videos, or multiple posts. This is an example of a sponsored post. If you have any other ideas, I’m always open to new things as well, just let me know! Spring is finally here! The sun is shining and flowers are blooming, but here at Really Big Company we are finding ourselves most excited about one thing: the start of brunch season! The thing I hate about these types of inquiries is they are not totally transparent with you. They obviously want you to share their post (for free) in something you’ve crafted based on their guidelines about whatever post topic they’ve come up with, but they don’t say that, and they don’t mention anything about compensation. Sometimes they’ll also promise to feature you on their social media channels – but I wouldn’t count on it. A retweet should never be currency for the time and energy it takes to write a post like this. Thanks so much for your inquiry! I absolutely love brunch, in fact I host one for my family every holiday. I’d love to work with you on a special brunch post, what does your marketing budget allow for a post like this? Generally, I will never hear back, or they’ll let me know they have no budget. Often they’ll promise social sharing or “good karma” (yes really) for your post. I either then archive it, or politely say thanks but no thanks. I hope these suggestions are helpful. I know these replies won’t work in every case, but tailor them to what works for you. And if you ever have any questions about how to respond to an inquiry, feel free to comment here or send me an email. I’ll do my best to send suggestions your way! How do you deal with ambiguous or not-so-awesome brand inquiries? I’ve received similar email inquiries in the last six months, and I’ve refused at least half of them especially when the email comes off shady or the nature of their brand/service doesn’t really cohere with my blog. Thanks for sharing these tips, Jenn! If some brand ask you to dm your details what does. That mean ? What details I need to provide em? Hi Sara! I’m not sure since I’m not sure since I’m not privy to the context of their request, but if you’re interested in working with this business, I would recommend sending a short message introducing yourself and requesting a contact name and email address to reach out to. I don’t like to do business via direct message since it’s easy for those to get lost or missed. Hope that helps! Some great responses to all these emails. Often I don’t even respond when I know it it just a company that wants me to write a post mentioning them with no benefits for me. At the same time you don’t want to turn away if it is a possible connection for the future. That is very true, and one of the reasons why I try to respond to all inquiries. If the email is unreadable, however, I generally assume that to be just straight up spam and don’t even reply! This is an amazingly helpful post Jenn! I really can’t stand those emails like the last one you stated – I get them all the time, and half the time I just don’t have the time to respond to these ‘time wasters’ so I don’t! I’ve only ever had one company that I genuinely wanted to work with and they were amazing! Some great things can come out of collaborations, but there’s lots of weeding through rubbish emails too! I got one of those last ones recently, but luckily it was about something that I wouldn’t have written about anyway (working after college, but I’m a SAHM so they obviously didn’t read too much of my blog). That one was easy to say no to. It’s so much easier when they don’t fit with your brand, but many times it’s so ambigious that I can’t even tell if I’d want to write about them or not! Oh, the worst! Also I hate when they include something like, “We’re going to pick a few of our favorite posts and share them on twitter!” Um, no. Ugh, yes! Those are the absolute worst. It basically translates to… you’re not getting anything out of this at all. I so need this! Pinning! haha I can’t stand that last one. They ask for me to basically write an entire post for them for free with no free product or anything….umm no? lol. I reply pleasantly but I’m thinking “wow, that’s not happening”. Great post Jenn! Thanks Julie! I know, I’m surprised at how common of an occurrence it still is! Thank you so much for writing this Jenn. It’s such an important topic that I am really passionate about lately. I’ve been working on a blog post on this exact subject for ages but I’ve not published it because it’s so out of the norm for me. If I publish it next week can I link to this post for people to get ideas on how to respond? I am so appalled by the way companies think it’s okay to request your time and effort for nothing in return!! I get these emails far too often. Thanks for helping me figure out how to respond! UGH hate those too! I haven’t had one in awhile so I completely forgot about those competition things. Ridiculous! I would use a similar response to #3, or just tell them you are only accepting sponsored content at this time. I have so many of these that I just haven’t responded to because I didn’t know how. Thank you so much for posting this! I needed some serious direction on how to respond to these types of emails. I hate when companies want you to write things for free. Like they don’t understand how much time and effort it takes to write a great post with pictures included…and then promote it. You’re so welcome, I’m glad it was helpful! I know, it really is awful. I mean, I spend hours on taking and editing photos alone, let alone writing and promoting it! No way will I do that for free for something I may not even end up liking! This is SO helpful! I’ve received a few emails like this. I’m curious, how do you respond when you are offered a product that you don’t have any interest in? My typical response is to thank them for their interest, but that I don’t believe it would be a good fit at the current time. However, I feel so uncomfortable writing those e-mails. I’m curious about how other bloggers respond. I usually say something like that – thank them for the offer but say that it doesn’t suit my blog, or that I’m not interested in writing about the product. People are usually pretty cool about that. Yep, that’s exactly how I respond as well. I usually add a “keep me in mind for future opportunities” as well, because you never know! Very helpful – I don’t get a lot of emails like the good ones, so I also don’t have a lot to show the people who don’t talk about money, if that makes a sense. I really don’t like the ones that are just like hey you should write a post about our products for no reason! most of the time i tell them thank you but no thank you it’s not for me – because i figure if they are going to offer me something they would have already. i actually responded to an email the other day saying no thank you for xyz reason, said nothing about money and they sent me a generic ‘we don’t have room in the budget but good karma and publicity blah blah’ and i wrote back and called them out because i hadn’t said anything about monetary exchange and it just made me even more mad and definitely not interested in doing it, lol. Oh those are terrible! I generally will ignore those. Usually they are just spam links I’ve never heard of! I think it depends, you never know, they could have something to offer in the future, maybe not. I think that’s where having email templates on hand can be really helpful! Thanks for this! I actually just got one of these yesterday- somewhere between the ambiguous and the ugly. The sender didn’t even mention the name of the company, and her email address was a gmail address! I responded expressing interest and asking for more info about the company, but I doubt I’ll hear back. It’s good to see some response examples for the good, the bad, and the ugly! Ugh, so annoying! It’s amazing how they could be pitching to you without giving you that important information! Hopefully it works out! This is so helpful… saving this post! Thanks! So glad you found it helpful, Claire! I JUST received one of these emails (like your last example) this week. My response was similar, although I let her know that I just don’t have time to do uncompensated posts and that if she ever wanted to contact me with a business proposal, I would happily respond. I actually heard back from her, and she totally understood. I was a little miffed that someone would ask me to work for free. I know, it amazes me what the expect bloggers to do for free just because we are not a standard “business”. Glad she was understanding, I’m sure she hears that a lot! Jenn, you are SO SPOT ON! I’ve been especially frustrated by this lately after having received a few less than stellar requests. One brand offered me their branded merchandise including – wait for it – STICKERS instead of my rate. What?! I wish we weren’t always assumed to be mindless people always searching for free junk. We work hard and the right people will provide the right quality making posts even more worth it and beneficial. I wish more brands recogniZed this and acted like the first example you gave!! Thanks Erica! Stickers? Oh man, that’s terrible! Agreed on your other points, we do work hard and blogging isn’t easy! This is a great post! I often get emails like the last one and never really knew how to politely turn it down because I learned from experience it was not a paid post, or even worth my hard work and time in any way. It’s upsetting that so many companies expect bloggers to do work for free, and with such strict guidelines. Thanks for sharing these wonderful tips! You’re very welcome, Cole! So glad they were helpful. And I agree, it is upsetting the expectation that we should do work for free! I’m not at the point in my blogging career yet where I’ve gotten any of these sort of emails, but it’s interesting to hear about what a spectrum there is. It amazes me that these are businesses and yet they don’t always treat you with professional courtesy and respect! Thank you so much for sharing this – really informative!! I know, it’s amazing isn’t it? They expect us to be professional and adhere to their guidelines, but with nothing in return for us! Glad it was useful, I’m sure you’ll be getting these types of emails soon! Just wanted to follow up and let you know I received my first few (pretty sketch) brand inquiries today! I was so shocked and caught off guard … and immediately went back to find this post to help draft my response! Thank you again! E-mail #2 style messages aren’t my favorite either, but I have obtained sponsorships out of ones like that. Some people just aren’t good at writing the initial pitch, I guess. This is probably bad, but I just ignore most messages like e-mail #3 now. I used to reply politely to all of them, but I quickly grew tired of the “no compensation, great exposure” responses that usually followed. Agreed, often I never hear back from messages like #2 but you’re right, sometimes they just don’t know how to write the pitch! If #3s respond back with that type of message, I just delete them! Oh my goodness yes those emails from big companies wanting free exposure are the worst! I always reply telling them what I would charge for a sponsored post and usually don’t hear back. One thing to point out is a lot of companies that will paid for sponsored posts won’t consider you to do a campaign if you’ve worked with a competitor in the last 3 months so by agreeing to do one with them for free would exclude you from potential other actually profitable opportunities! Oh that is a great point! Another good reason why you should never bother working for free with brands, you never know what future opportunities you could miss out on! You’re nicer than me. I only ask one question for those awful emails: What’s your marketing budget for a sponsored post like this? I only had one person write back and actually give me a number. I was glad I asked on that one. Haha, well that’s to the point and I bet you get a lot less responses then I do. They almost always email me back telling me all this great “social” promotion they’ll do for me. Yeah, right. Great post! I loved reading how you responded to the different inquiries. I just started blogging again, so I haven’t received a ton of emails like this, but there have been a few that definitely fell into the category of absolutely zero compensation. The worst is when you can tell that they haven’t even read your blog and it’s just so impersonal. When it starts with “hello brookemeaganjones.com”….I’m not likely to respond at all! Impersonal ones really get me too! I’ve been waiting for one that says “Dear Rigby,” and I finally got it. I couldn’t help but laugh! I usually just ignore and don’t respond at all to the last type. I got an e-mail once for this company asking me to promote/review their watches and then when I asked about them sending me one for review purposes I never heard back. How can I review it if I don’t own one? I’d love to get more e-mails like the first one you mentioned! I know, isn’t that just crazy?! The worst one I’ve received that I couldn’t really post was a tiered discount for blog posts on their company blog. They wanted 5-10 posts just for a 20% discount from their shop! So glad it was helpful, Janina! Jenn, this is so helpful! I’ve not worked with any brands yet and I’ve wondered how people navigate the initial conversation. Thanks for sharing this. I figured I’d treat it how I generally treat people wanting design services from me– Yes, we’re friends and yes I can help you design your living room, but I also have to make a living. It’s so important to know your worth as a creator and to insist on being compensated for your time. You can’t eat off of retweets or “exposure”. So glad it was helpful! And agreed, no one can make a living like that, and blogging is an expensive hobby if you are trying to grow it in any way, shape, or form! This seems to be a popular topic right now! I wrote just last week about my experience with Williams Sonoma trying to get me to write branded content for free. Based on the comments, they’ve done this with a LOT of bloggers. It’s so disappointing that large companies, who clearly have marketing budgets, think so poorly of bloggers and our work. That’s just crazy! I went and read you post… can’t believe how many bloggers did work for them for free! Super sad that big companies like that think it’s okay! Nice post and tnak you for it .. it helps me beacouse i got some mail like this week or two ago :). So now I know what to do :) ! So glad it was helpful, Tamara! Haha, definitely true! Glad it was helpful, Courtney! This is wonderful, I’ve been getting the last type and getting excited but then I don’t get social shares or anything in return. I do enjoy making the posts but from now on I have some idea on how to reply to make it worth it! Thank you so much for this post! You’re very welcome, Fiona! I learned in a similar way, and honestly it’s just a waste of your time to write posts like that. Most of the time, the social sharing “benefits” will never make up for the time you spent writing/photographing/researching for the post. These are really awesome tips! I remember at first I was really excited when someone reached out to me but after a little while I realized that there was no real benefit in what they were offering. These days I just don’t respond to any inquiries like the last one you mentioned! Haha yeah, I know exactly what you mean. It was so exciting… until it wasn’t. I still respond because you never know, but generally I expect to never hear back. My FAVORITE response to those last types of emails is when I respond, just out of curiosity, about what type of social media reach they would have and I don’t get a response. I love your template emails because I see people asking how to respond to those on a regular basis (in Facebook groups). Yeah, I’ve gotten a few of the “no-strings” emails recently as well. Those are great – then you don’t have to feel pressured to write anything, and if you do, then it’s great for them. This is such a helpful post! So far all I have been contacted about are for book reviews, they send me the book, I read it, then post about it. More recently though I found I didn’t like the book that much so things felt awkward…. I kinda just put a disclaimer on my post saying I wouldn’t recommend it to just anybody based on the content. IDK, it’s a tough situation to navigate! Thanks for the tips! Thanks Whitney, so glad to hear it was helpful! I think in the future, if you’re working with a publisher directly, letting them you only write honest reviews about the books you read would probably help make you feel a little less awkward. I often get books through NetGalley, and I’ve never had a negative response about a not-so-positive review. I think they’re used to it! Thanks for the tips Jenn! I just started to receive some of these and I was just flabbergasted on how to respond (because they were of the really not good variety) so I just didn’t and I know that probably wasn’t the best maneuver. Thanks for this post. I never really know how to respond, but am glad I’m on the right track. THANK YOU for this post. I hate those emails that tell me about a post I should write but don’t mention anything about my compensation. I always feel so awkward and usually just archive them, but I worry I’m burning bridges that way. Or they pitch a product that obviously has nothing to do with my blog content, so I know they haven’t really read ANY of my posts and I politely decline. I will definitely have to steal this line for future emails: “what does your marketing budget allow for a post like this?” Great job! Aha yes, those last ones crack me up. Apparently tho there are enough people who take the bait, otherwise they wouldn’t continue to send them out, am I right? Great post. I wish I’ve had that around a couple of months ago. My replies now are a long the same lines. And I’ve created a template canned response for those I absolutely do not want to work with. While I have not been approached yet, I hope to work with brands in the future so these are great tips and suggestions on how to respond. Thanks for sharing! I have a couple of these in my inbox that I need to respond to but haven’t because I’m sick of saying no. Ha, I know what you mean! It gets tiring, doesn’t it?! “Good karma”? Ugh! We bloggers work hard on our blogs, and we deserve compensation, period. I get doing a free post if it’s for a brand you really love that no one has ever heard of–maybe they’re new, or super-indie–or maybe if it’s a favor for a friend who’s launching her own business, something like that…but those generic requests to write sample posts drive me batty. I know, isn’t that just crazy! I hate them too, the only times I consider it are like what you said – if the business is brand new or if it’s for a friend. Even then, I prefer to just share it on social media. It’s hard to write about something if you don’t have much experience with it! If only they´d make the effort of using your name. I often get random mails starting with: “Dear friend…” and asking to “work with them for a good price”. So annoying! Haha yeah or “Dear Blogger”. I instantly know that those generally aren’t going to end well! It really only takes a second to find out a first name! what a helpful post- I’m new to blogging but hope to work with companies in the future. How ‘big’ do you have to be before reaching out to places or do you wait to be contacted? How would you know what to charge? If you do a product review, is the product the compensation? Personally I don’t really have the extra time to reach out to companies, so I wait for them to contact me. I do work with a couple of influencer networks with campaigns that I can apply to, however. In terms of size, I didn’t really start doing much in terms of sponsored (paid) campaigns until I was consistently hitting 10,000 page views/month. Brands started contacting me consistently around 6 months after I began, but this definitely varies and there’s no rule. Thanks for posting this – just saw your link via the passionproject! Bookmarked and pinned for the future. This is perfect! Thank you so much, Jenn! This will definitely come in handy to me. Eek, so sorry I missed replying to you Taylor, you ended up in my moderation queue! So glad it was helpful! GREAT post, girly! I recently got an email that stated in the initial email there was compensation to be discussed and as it turns out, they wanted a free post and you could sign up for their affiliate program. GOOD – FREAKING – BYE! I was so bummed because it was a pretty big company that could totally afford to pay for the work they wanted. I totally agree with you Ana! 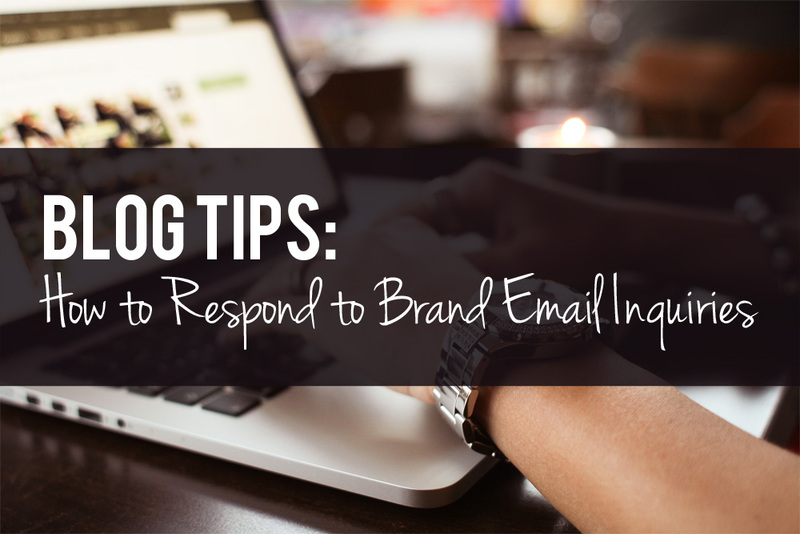 This post answered all of my questions about how to respond, and which emails I should take seriously! Super helpful advice, because it’s hard not to get excited when brands contact you! Good luck with your blog love! Great tips Jenn. Thanks for sharing, the way you respond to collab mails is really humble yet perfect reply. Thanks jenn for the post. Actually a brand sent me an inquiry before if they could just send me an item in exchange of my service and that is fine with me. However it must be equivalent with my rate and the products that they sent is ok but its just only half of my rate. Anyways Im still thankful but i hope i do get a fair payment or equivalent item after giving my service. This was so helpful! I just received one of the “ugly” emails you described and had no idea how to reply. It’s the first time anyone has reached out to me like that. Thanks for the tips! This was so helpful! I found this on pinterest because I was looking for a way to respond to a very vague very awkward email! Thanks! Bookmarking for future use! Thank you for this blog post. i’m glad I found your blog. I nearly said yes to the company’s proposal. Thanks for this post Jenn! I get a lot of these emails and for awhile I would do them because I felt like i would help me to gain experience but I m getting to the point with my blog where I want it to be more than hobby so I was looking for the right ay to respond o these emails. Much appreciated! Thanks so much Jenn. Today I got my brand email inquiry and I needed some suggestion and I googled for some reply methods. Landed on your page, it was simply awesome. Hey Jenn, thank you so much for this post! Like many of your other commenters, I’ve gotten several of the “The Ugly Emails I Absolutely Abhor” and was at a loss at how to deal with them, especially since they keep bypassing the advertising/sponsored posts/reviews subject on my contact form. They tell me their reason for contact is “General/Comment” which irritates me because I feel like they are not paying attention or they are trying to wiggle their way around it for a free post. Anyway, I found your suggested responses to be super helpful. I was wondering though after you ask them what their budget is and they come back and tell you no budget or whatever, what do you say to politely decline? Again thank you so much for this article! SO helpful! Wow!! This is such a useful post. I just had a brand contact me for the first time and they are willing to talk dollars and cents. In the past, many brands just wanted me to write posts in exchange for social media posting. I had to politely decline. Thank you so much for sharing! This was very, very helpful. This is exactly the discussion I’m looking for! I’ve received a few of the first type of email, but I’m so paranoid about attached strings that I’ve only just started replying. I’m worried about getting a freebie only to find I don’t like it enough to promote it? And then feeling obligated to because I got it for free? Does anyone else have this fear or know what to do with it? I sell my own products to my audience so if I’m going to promote another product to them, it has to be really high value, I have to really believe in it. Is a promotion expected here? Or can I test the product and decide not to review or promote it? It is polite, yet made it clear they have to compensate for your time and effort. Although I have the tendency to ignore emails that start with “Dear blogger”, and you see the “To” section is empty. Meaning the sender blast a generic email to many bloggers using BCC, hoping to catch a fish or two. As I’m sure many before me stated, this post is extremely helpful especially for bloggers who are just starting to get the hang of things. Thank you! So glad it was helpful, Karolina! Hi there jenn i love your advised i’ve recently had a brand reach out to me to be a brand ambassador! Even offered me my own code to share with my audiance and if i got 5 people t o use this code they will send me a free product in exchange and also gave me a personal discount code for future purchases. All they want me to do is promote there product on m yu instagram. Pleeeeease help me its my first offer from a brand i am super excited but nervious and worried at the same time. Please email me as soon as can please. Hi Adrienne! Congrats on your potential brand ambassadorship! That’s very exciting. :) While it’s nice that they’re interested in working with you, have you tried and used their products before? I wouldn’t recommend sharing their products and your discount code with your audience if these products aren’t something you personally have tried and can honestly recommend. Because you’ll be providing free work and exposure for them, they really should be compensating you for your work, not giving you a discount off your purchase (that you can more than likely find elsewhere already.) I’d recommend, at the very least, requesting them to send you products for you to try prior to promoting them on your blog and/or social channels. Hope that helps! Love this post! I’m curious how you would respond to an email from a company you worked with before that wants more work done for no addition compensation. The original contract/email made no mention of future required posts, only that we could “continue a relationship”. Sending out emails is so hard! Totally agree! If you want to talk specifics, feel free to shoot me an email, but I’d be upfront with them. They clearly love your work, so you’re in a great position to ask for additional compensation, whether that’s money or otherwise. Tell them that you enjoyed working with them and would be happy to continue the partnership, and you’d love to know if they have a budget in place for the next set of posts! Loved this post! I’m also wondering what safeguards a blogger should have while working with a brand. Like what address to give them for shipping products, or what information to give to accept payments. Seriously Amazing! Thank you so much for this! Hi Rachel! Thanks so much for the suggestions – I’ll work on a post that covers some of those topics more in depth. In the meantime, some of the safeguards I utilize are having a post office box that I receive mail at. Additionally, I have a business PayPal account, a business bank account, and a tax identification number that I use for my business so I’m not giving out personal details when it comes time to get paid. I hope that helps!